One of my resolutions this year was to improve the decor of my apartment. The idea was to make my apartment look less dorm like and more young professional without spending a lot of money. This past weekend I set out on making some minor improvements. My first priority was doing something about my cheap-o Target book shelf. I've had this bookcase for over three years. I use it to store books (obviously) and I use the top to hold my makeup. There’s a mirror hanging right above and that’s where I get ready in the morning. I’m changing up the look of my room and want to go with brighter colors. 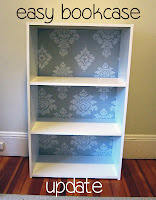 Originally, I wanted to paint the bookcase white and put some sort of pattern on the back. 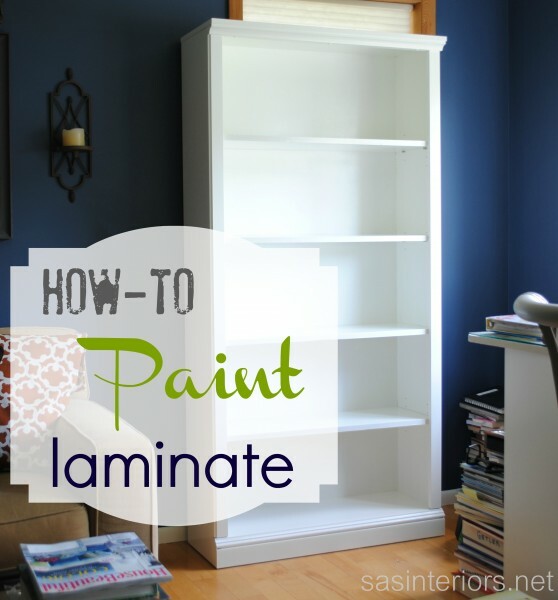 I found a great tutorial on how to paint laminate furniture. 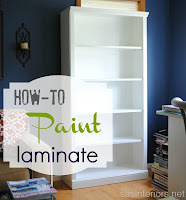 And I saw this pin about attaching fabric to the back of a book case. However, I rethought the idea of painting the bookcase for two reasons. First, I live in an apartment with no porch or yard. I don’t really have any room to be painting furniture. Secondly, I noticed the shelves were starting to bow and it didn't seem worth it to put in effort for a bookcase that was falling apart. I decided to see what else I could find, knowing that I didn't want to spend a lot of money. 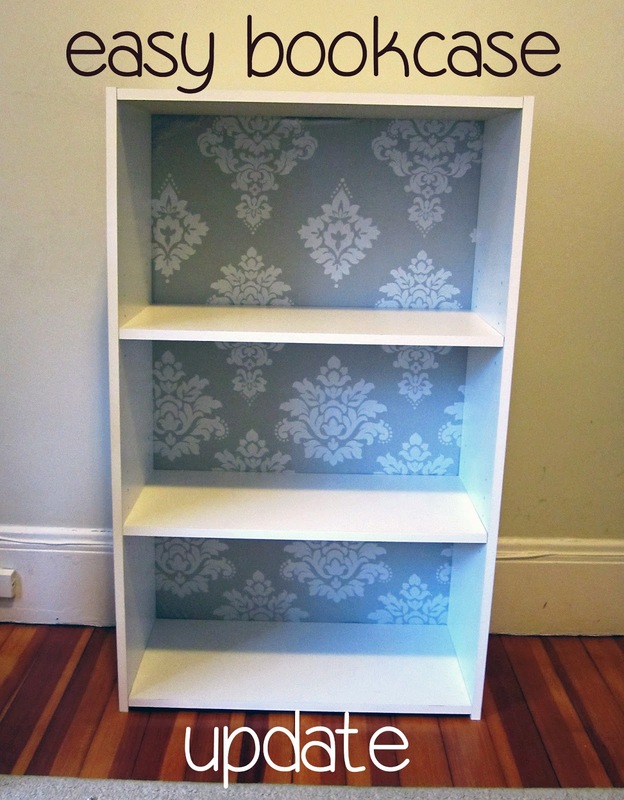 Thankfully, I found the same bookcase in white at Target for $21.99. Not too shabby! 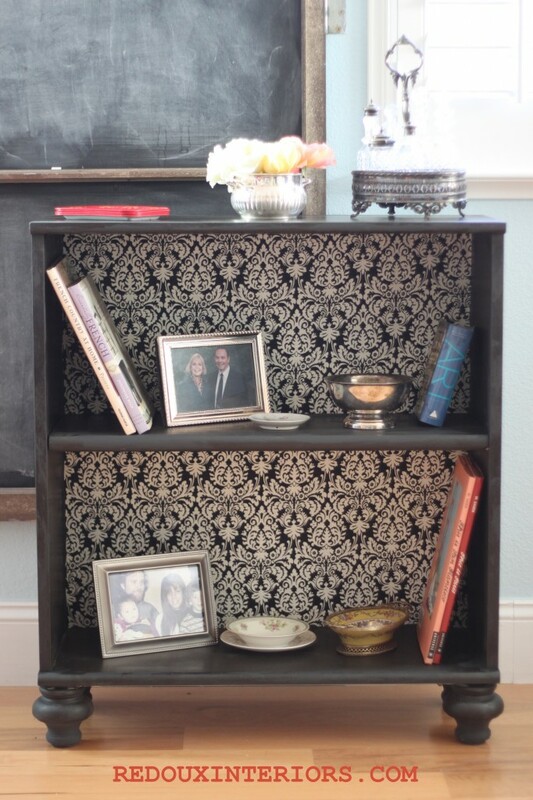 I still wanted to jazz up the back of the bookcase with some fabric. I recently bought a new comforter for my bed. It’s a pale/mustardy yellow. I like the combination of yellow & grey so I tried to look for a grey fabric to attach to the back of the bookcase. There aren't any fabric stores near me (that I’m aware of) so I decided to use a shower curtain as fabric (again). I got this cute curtain from HomeGoods for $14.99. I liked that it was grey and I think the pattern is vaguely reminiscent of the pattern on my comforter. Prior to assembling the book case, I attached the fabric to the backing. To do so, I laid the backing down over the fabric, and used it as a template to cut the shower curtain. I made sure to iron the fabric. Then using a spray adhesive, I attached the fabric to the backing. I assembled the bookcase as directed. It’s a very simple item to put together. However, I did run into one little snafu when attaching the backing to the case (of course!). I must not have been paying attention too closely because in two spots I hammered the nail in crocked and it popped out the side. I’m planning on getting some clear nail polish to put over top so it doesn't get worse. It’s disappointing that this happened but its very minor. From the front the book case looks great. I’m loving the fabric I picked out! Now I just need to figure out what to do with all the extra I have left over. I’m thinking I may try and make some picture frames with it or use it on a lamp shade. I think it looks way better then the old bookcase. And this book case cost me only $36.98! I think its quite the improvement. What do you think? Anyone else been making quick, cheap updates to their furniture? 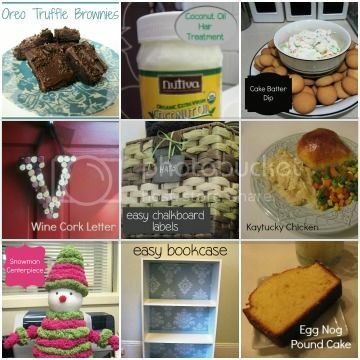 Update: If you like this post, check out the bookends I later made to go on the shelves!